At least 2 hours before preparing meal, place peanuts in a bowl and cover with water to soak. After soaking, remove peanuts from the water, reserving the water, and place in a food processor or blender along with soy sauce, chilli, vinegar, sugar and ginger. Pulse a few times, adding water as required to thin the mixture to a sauce-like consistency. Let the food processor or blender run until nut mixture is smooth. Add in coriander and pulse until blended through evenly. Add salt and pepper to taste if desired. Preheat oven to 180˚c. Cut the carrot and capsicum into bite size pieces and toss in a roasting pan with beans, broccoli, olive oil, black pepper, and sesame seeds. Roast for 15 minutes then stir in chickpeas. Roast for another 15-20 minutes until vegetables are tender. 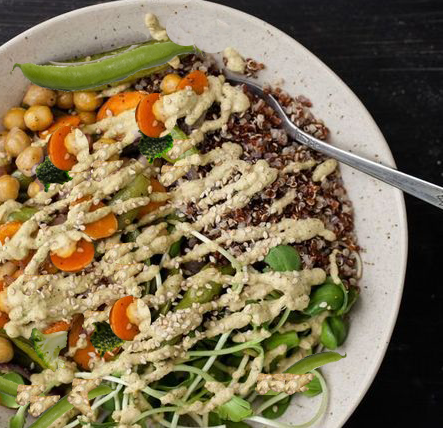 In a bowl, toss together vegetables, quinoa/rice, and sprouts. Drizzle sauce over bowl to serve. Other low FODMAP nuts can be used to make the sauce if desired e.g. macadamia nuts, Brazil nuts, pecan nuts etc. Make recipe in a double batch and divide into individual serve containers for a quick and easy lunch/dinner to grab on the go!